It’s that time of year again. The days are still hot, the soil still concerningly dry and the breeze still smells of smoke but they are getting shorter. Summer is slowly sliding into autumn. The garden knows it. The leaves on the last potatoes have been yellowing. The beans, so prolific this summer, are finishing. A lone pumpkin is beginning to ripen on the self-sown vine. The red winter kale has finally admitted defeat in the face of powdery mildew and aphid attacks and gone to seed. Summer’s bounty is fading. It’s been an odd growing season, and my first summer here at the Cottage. It was exceedingly hot1 and dry,2 with horrible winds that stripped the moisture out of everything. I don’t like to water much, but even my well-mulched, water-conservative garden has needed a good weekly soaking. The eggplants and chillies enjoyed the heat and I’m looking forward to harvesting a handful of aubergines. The tomatoes haven’t done so well though, or the zucchini: where I was expecting great gluts I’ve ended up scavenging from friends to gather enough for preserving. Still, I’ve had plenty to eat and largely kept myself in veg this summer (with the notable exception of carrots, of which I grew just one). 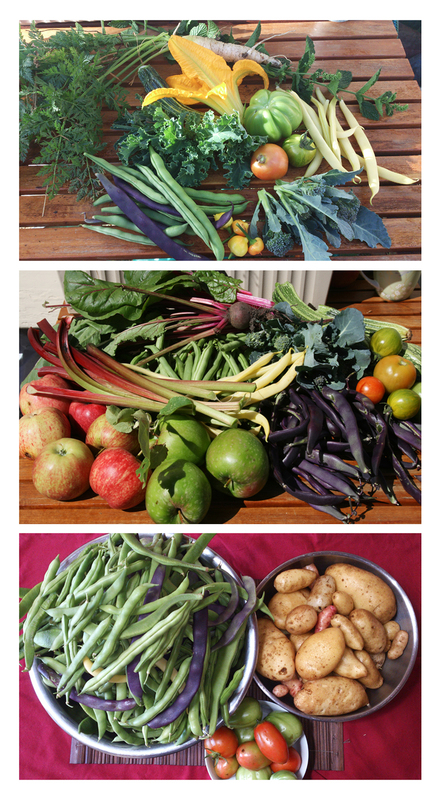 As the season progressed, so did my weekly harvest! Now it’s time to prepare the garden for autumn and to stock my stores with the excesses of the summer. Yes, it’s relish time again! The over-ripe tomatoes I scavenged from a friend’s garden have been turned into jars of rich, summer flavour. Soon that same friend’s surplus giant zucchinis will be cooked up with Indian spices for a spicy savoury relish. A couple of kilos worth of beans – green and scarlet runner – have been chopped and blanched and bagged up in the freezer for winter meals to come, and rhubarb has been stewed and frozen for winter porridge breakfasts. The apples that survived to worst of the weather only to fall prey to codling moth have had the edible parts rescued, been poached in vanilla syrup and stowed away: a delicious sweet treat despite the beasties. A good three kilos of potatoes are paper-wrapped and await a dark place to be stored. It’s time, now, to prepare the garden for my winter crops. There are beds to dig, seeds to be sown, and if I don’t do it now there will be no backyard harvest through the cooler months. The soil needs a lot of love in places before much of anything will grow, so the compost bin has been shifted and I’m prepping green manure to get some much-needed organics worked in. One over-worked bed will lie fallow this season, then be planted out with herbs come spring. For now, though, it’s autumn and winter veg I’m thinking of. I have interesting new heirloom seeds to sow: golden beets, fractal (romanesco) broccoli, ruby sprouts, mammoth leeks and purple cauliflower. Poor little plants will need to fend for themselves though, as soon I’m heading overseas again for a while. I’m relying on the kindness of friends and neighbours, on my little community, to tend my garden while I’m gone. That’s the magic of a garden though: it doesn’t just grow food, it grows connections.3 This summer my surpluses have been shared with others. I’ve traded beans and potatoes for apricots and nectarines. I’ve swapped seeds with other growers. I was given the most amazing types of tomatoes by Pauline Mak and traded garden pest info with Provenance Growers. My garden does so much more than feeding and nourishing me: it feeds the bees, provides home for the birds, it binds and enriches the fine black soil and it creates places for all sorts of crawlies to scuttle about. It creates a topic of conversation with friends and strangers alike, and allows the free trade of information and sharing of experience. 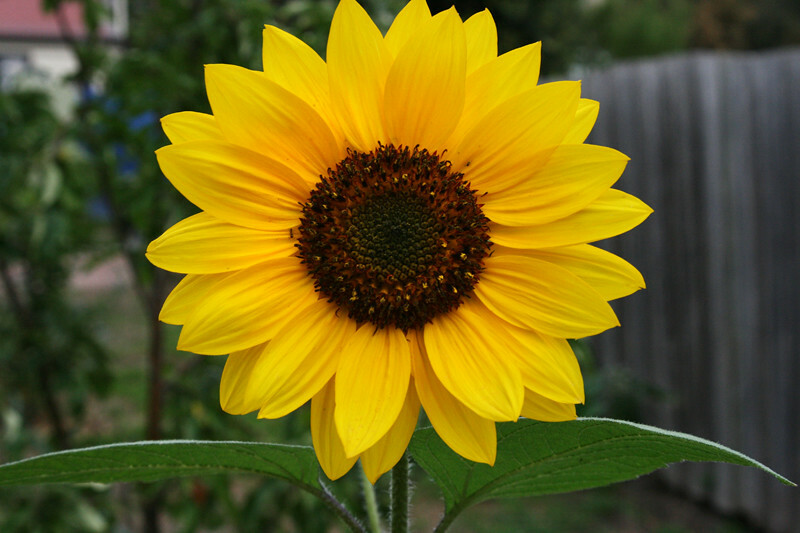 It supports simple acts of giving and sharing and, like the sunflowers blooming down the bottom, spreads a little beauty through the world. This is what my garden grows. What about you? What’s happening in your patch right now? Are you starting spring planting? Still awaiting the thaw? Or, like my parents up in south-east Queensland, waiting for the saturated soils to dry out enough to plant? What do you love about your garden? Tell me, what does it grow? Records were set for the hottest single day (41.8oC), the hottest summer overall (highest mean summer maximum) and the number of days above 30oC – source: Bureau of Meteorology. Only 39% of our average summer rainfall fell – source: Bureau of Meteorology. The social benefits of a garden – source: Irish Food Board. So cool to see someone enjoying the last bounties of summer as spring only just arrives up here. What a beautiful harvest! Thank you. It’s been a tough year in the garden with crazy hot, dry, windy weather and I’m happy a few things survived it. It’s looking good, fantastic looking crops. Hopefully I will be starting in April, but nothing much goes in the ground until mid May; other that potatoes and oats; which we are growing for the first time as a source of animal feed, along with beets and pumpkins. My chillies didn’t do so well this year, but I’ll over-winter them in a sunny spot indoors and next year there will be many! Growing feed for animals adds another dimension I’ve never thought about. My chillis died this year :(:(, They flourished for years but just didn’t make it this summer. And I’m having trouble growing basil for some reason as well. I never had to buy it before and I had to this summer! Lovely lot of vegies you have there and such a beautiful garden!